LED lighting offers huge advantages in energy efficiency, lasting far longer and requiring 90 percent less power than incandescent bulbs. But the light-emitting diode bulbs aren’t perfect, and researchers continue to search for more efficient phosphors and other materials to improve performance. UH chemist Jakoah Brgoch has received a NSF CAREER award to improve light-diode emitting lighting. 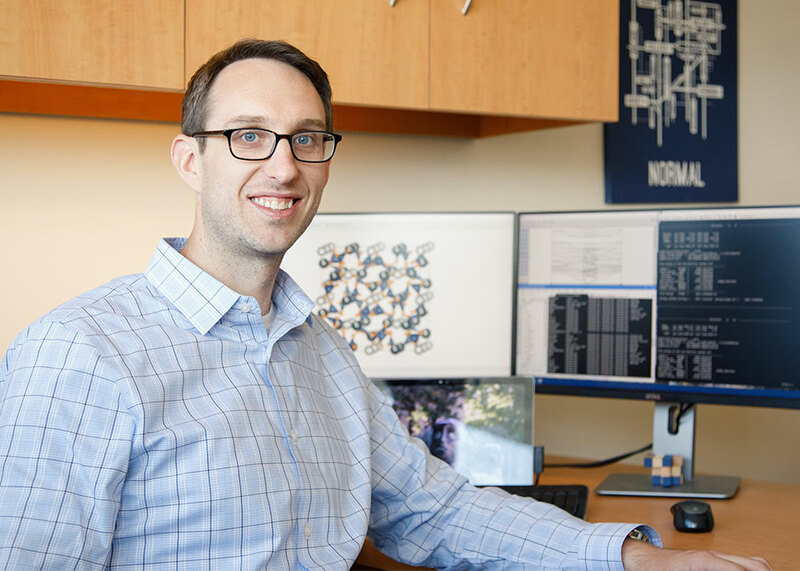 Jakoah Brgoch, assistant professor of chemistry at the University of Houston College of Natural Sciences & Mathematics, has received a five-year, $656,000 NSF CAREER award to pursue answers. Brgoch’s lab works in machine learning and prediction, as well as synthesizing new compounds to find new energy efficient materials. The award calls for Brgoch to use machine learning and data-enabled algorithms to identify new materials for LED lighting systems, as well as to determine how temperature changes affect the function of materials and identify materials that would be less susceptible. LED bulbs, also known as solid-state lighting because they are made of solid materials, with no filament or tubes susceptible to breakage, are cooler to operate than incandescent bulbs, and Brgoch said heat isn’t a problem in homes that use LEDs. But it can be an issue in industrial and commercial use, such as car headlights or stadium lighting. That project will begin with learning how a material’s structure changes when light is absorbed, Brgoch said. “We have to learn to model the excited state of these materials and how that changes as the temperature increases,” he said. His lab will then address how to minimize the changes, either through modifying existing materials or the discovery of entirely new materials. The CAREER award also promotes undergraduate education and STEM outreach, or science, technology, engineering and mathematics, and Brgoch has several projects on tap. He has worked with the American Chemical Society’s Project SEED for the past three years, bringing high school students to work in his lab during the summer, and he will continue that outreach. But Brgoch is also interested in helping undergraduate students connect with research labs on campus, a process that can be especially mysterious for first generation and other underrepresented students. “The chance to work in a lab is a critical aspect of showing students that there is more to research than what you learn from a scripted lab exercise,” he said. “There is a lot of research that shows dramatic learning gains” when students participate in undergraduate research. Brgoch also will organize a workshop on machine learning, to be held at the Hewlett Packard Enterprise Data Science Institute on the UH campus this spring and offering graduate students, postdoctoral researchers and young faculty the opportunity for hands-on training and a look at research in the field.